As the two vehicles will be restored off site, they must, at some stage, undertake a short journey on Network Rail between GWS Didcot and Milton Industrial Estate for transfer to to road transport. Some time ago Number 93 was examined in detail by the Society’s Vehicle Acceptance Body to investigate any potential problems in gaining the necessary “one trip” ticket for the vehicles, and we duly received a list of recommendations. We are now undertaking a similar exercise on Number 92, though we are not permitted under Heritage Lottery Fund rules to start any restoration work on either vehicle before the bid has been processed. We have, however, been able to replace the buffer assembly and coupling removed some time ago, and give the bogies a pad exam, to enable the coach to undertake a test trip on the Society’s main demonstration line. This was the first time that the vehicle had been moved more than a few feet since it was requisitioned as an accommodation coach by C&W many years ago. The test run took place in October and, with the C&W still having occupation of the coach, some members spent a couple of hours travelling in it during the running in turn. 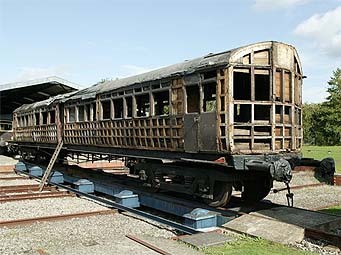 With all the planning done and information duly gathered, we were finally in a position to submit an application to the Heritage Lottery Fund for finance towards the restoration of the bodies and underframes of both numbers 92 and 93. The application was signed and delivered to the London office on 13th October 2006 - and yes, it was a Friday. The report, which addressed not only the engineering aspects of the project, but also made a robust case for the educational and historic interpretation elements, ran to about 150 pages and had to be submitted in triplicate, Naturally, we used recycled paper ! 06 July 06 - Walkover Seats from Peters of Slough, via Australia! 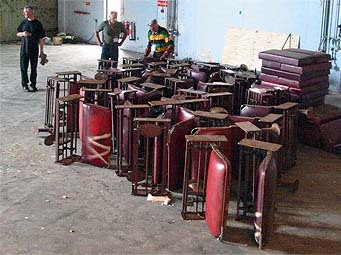 We are pleased to have taken delivery of forty of the correct type of 'walkover' seats - sufficient to equip both railmotor and trailer. 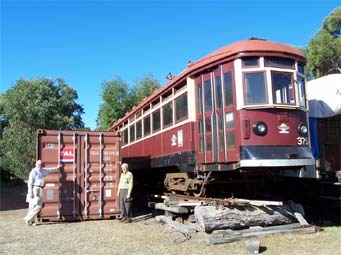 These were originally fitted to a tramcar from the Glenelg Tramway which was being broken up, and have been obtained after considerable negotiation, with thanks to two Society members living in Australia : John Moore and Reg Watters. 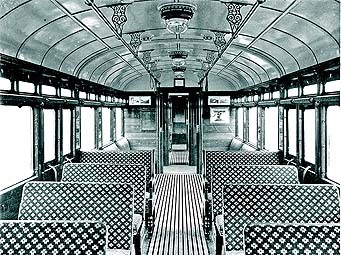 These are exactly the correct specification seats for our vehicles having been built under licence by Peters of Slough to a patent belonging to Hale & Kilburn of Chicago. The seats will only need a few minor repairs, repainting and recovering in the correct moquette. The current red leatherette will be replaced in due course with a dark brown background material with an off-white diamond pattern. Our Thanks go to John and Reg, and to Alan Moore for providing the necessary finance for the 'repatriation'. The first stage in restoring the vehicles was to see what remains, and to make a judgement as to what of the remaining material it would be possible to save. To this end, all of the remaining steel cladding sheet was removed from No. 93 by a team of volunteers in 1999 so that the timber framing could be inspected. 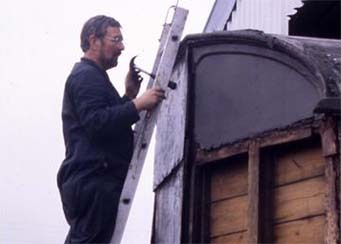 The cladding was not, of course, original but dates from the 1934/35 conversion to an auto trailer. 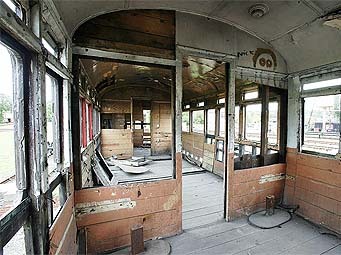 The railmotor was clad with wooden panels when new, and the restored vehicles will be clad in the same way. With the structure of the vehicles thus exposed, the next, very time consuming, process was to draw up a detailed specification of all the work needed to completely rebuild both No. 93 and trailer No. 92 to their original condition. This not only involved surveying the vehicles but has also required many hunts through the Society's considerable collection of Great Western coach spares to identify those items already in stock. As the work involved in restoring two coaches in such poor condition was beyond the capacity of our own Carriage and Wagon team, given all the other vehicles currently being worked on, it was agreed at an early stage that the restoration would need to be contracted out. After a long search and several false starts we were put in touch with the award-winning carriage workshops of the Llangollen Railway, who have the capacity and capability to undertake the work at a reasonable price and in an acceptable timescale.